On a late spring trip to Plymouth Beach, I had the good fortune of watching a flock of dunlin feeding in front of the rising tide. While I've previously photographed dunlin catching clams on Plum Island, it was a new experience to see this one pull out a worm from the exposed sediments. View more photographs of dunlin. Submitted to Wild Bird Wednesday - follow the link for this weeks posts! 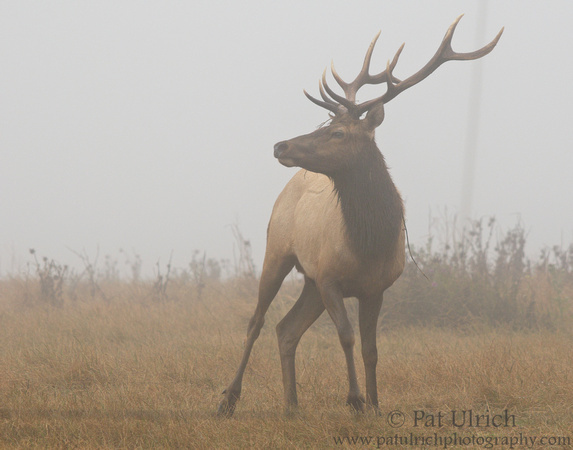 This photo of a bull tule elk in Point Reyes National Seashore is back from a foggy morning in 2011. If you look carefully, you can see a long vine wrapped around the base of his antlers. This is rather common during the rutting season as bulls aggressively brush their antlers on the ground to pick up grasses to carry on their antlers. For some elk though, this can be quite dangerous if they get tangled in broken lines of barbed wire fencing lying on the ground. This is a long introduction to refer you to a great write-up done by fellow Point Reyes photographer Jim Coda about the potentially (un)wildlife-friendly fencing practices in Point Reyes National Seashore. I've recently found myself reminiscing about the trip my wife and I took to Yellowstone National Park back in 2011. With the craziness of visiting the park while in the process of moving across the country, I never fully sorted and processed all of my photographs. While flipping through my archives recently I came across this portrait that was flagged as a pick but otherwise ignored. This pronghorn was a member of the herd that we saw almost every morning feeding near the Roosevelt Arch. 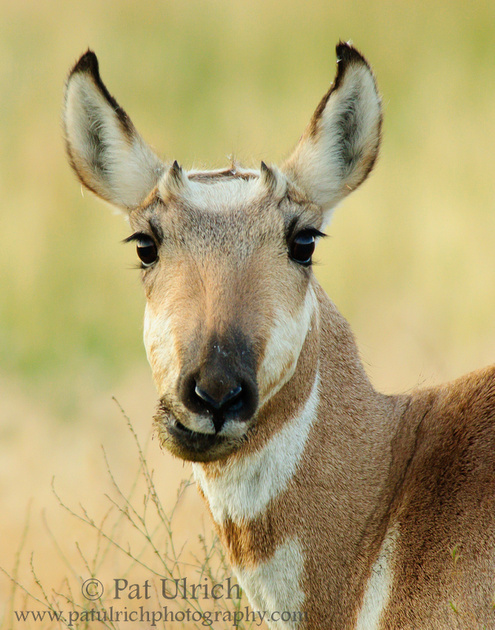 View more of my photographs of pronghorn in Yellowstone National Park. I have written previously about spending a fair amount of time looking for song birds to photograph in the wildflowers along the trail to Kehoe Beach in Point Reyes National Seashore, but one of my favorite images from the trip came from turning to the opposite side of the trail. It may not have the flashy colors of wildflowers, but I'm a sucker for marsh vegetation! Browse more of my photographs of song birds. Submitted to Wild Bird Wednesday -- follow the link to check out this week's posts! 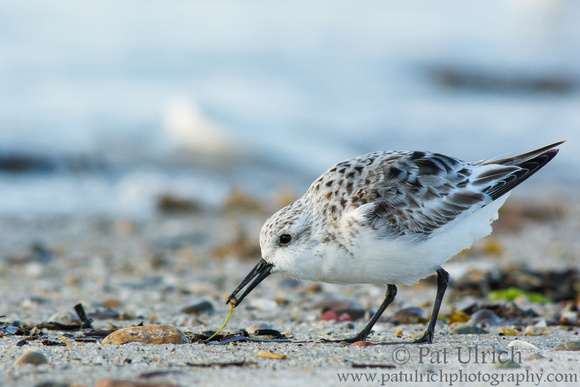 A sanderling checks the wrack for a snack along Plymouth Beach, Massachusetts. 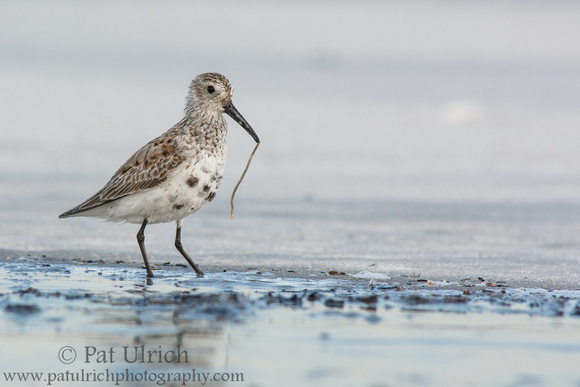 In late April, I took an evening trip to Plymouth Beach to look for shorebirds to photograph. On the west coast, I had seen sandpipers already in their summer plumage by this time of year, so I was hopeful that I could find the same here in Massachusetts. Unfortunately, the birds were only just starting to show some color, but I was treated to some very nice light as the setting sun cut through a break in the overcast clouds. The tide was rapidly rising at the same time, and this sanderling (Calidris alba) was frantically checking the wrack for something edible before the beach was covered again. 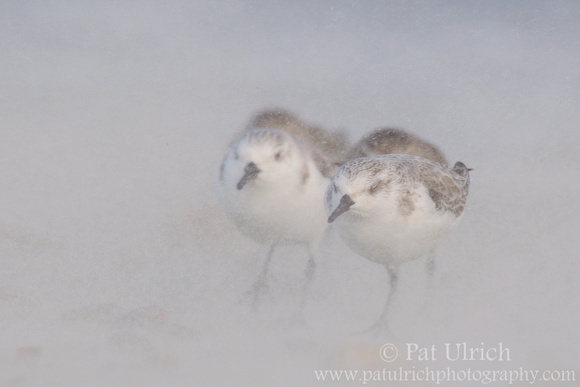 Browse more of my photos of sanderlings. It took me far too long to "discover" the shorebird haven that is Plymouth Beach. I had seen promising reports on eBird since moving to the area, but during my first two years in Massachusetts, I primarily went north to Plum Island when I was looking for shorebirds to photograph. Last March though, I finally made the drive south to Plymouth, and it very quickly became a favorite location. In the offseason (from October through March) the beach is even dog-friendly, and my wife and pup joined me for this trip. It was a bit unfortunate that the wind was whipping around the whole time, as my poor terrier got more than a little sand-blasted during the 6-mile plus round trip. Like these sanderlings though, he seemed no worse for the wear, as he hunkered down and leaned into the wind and blowing sand. View more of my photos of sanderlings. 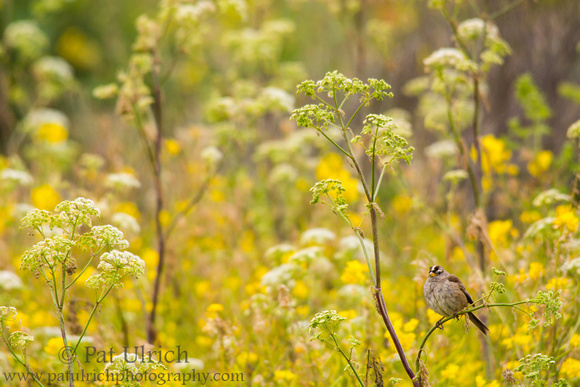 A white-crowned sparrow perched in the summer wildflowers along the Kehoe Beach Trail in Point Reyes National Seashore. As I've mentioned in a previous post, the Kehoe Beach Trail is one of my favorite places to look for wildlife hiding in the sea of wildflowers that line the trail. I generally don't target song birds when I'm out looking for wildlife to photograph, mostly because I find it can be rather challenging to get close enough to obtain a bird that is relatively large in the frame and unobstructed by branches and such. However, a setting like this is, in my opinion, a great place to leave a lot of space around the birds. I particularly liked the layering to the wildflowers in this frame, with the white flowers extending on tall stalks above the yellow blooms. 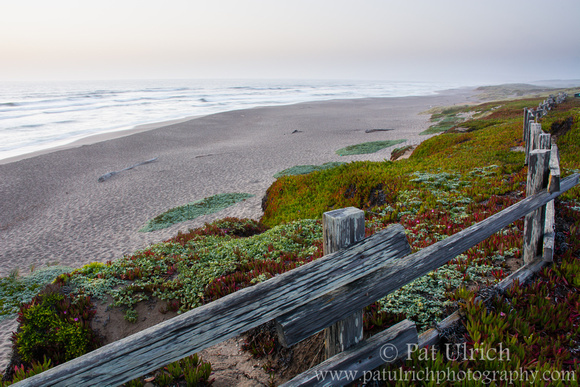 View more photos from the Kehoe Beach area in Point Reyes National Seashore. A California quail throws its head back in song along the Tennessee Valley Trail in the GGNRA. For a long time, an image that was high on my wish list (at least of local opportunities) was a clean shot of a California quail in song. They’re already such interesting and charismatic birds, but it’s taken to another level when they throw their head back and call out toward the sky. During my time in California, I had a few fleeting opportunities to attempt a shot, but none of the images I produced quite met my expectations. On my recent trip to California though, I was finally able to capitalize. On one of my first mornings in Point Reyes, I photographed a female quail calling out from her fence post. She was not quite as exuberant about it as I might have preferred, but it still felt like I was putting a small checkmark on my list. Then, on my lone afternoon spent in the Marin Headlands, I came across this very loud male who was repeatedly calling out from his branch of coyote brush on a hillside above the Tennessee Valley Trail. The same quail singing from his perch on an old branch of coyote brush. This quail was dedicated to making sure the whole valley knew he was there, and this gave me the chance to fire off a lot of frames from a few different compositions. It was exciting to have the chance to mentally score a photo of a quail singing in such a great setting as well. Coyote brush is a bit more appealing than a standard fence post would have been – and the unique twisted branches he selected as a perch really added some great character to the scene. 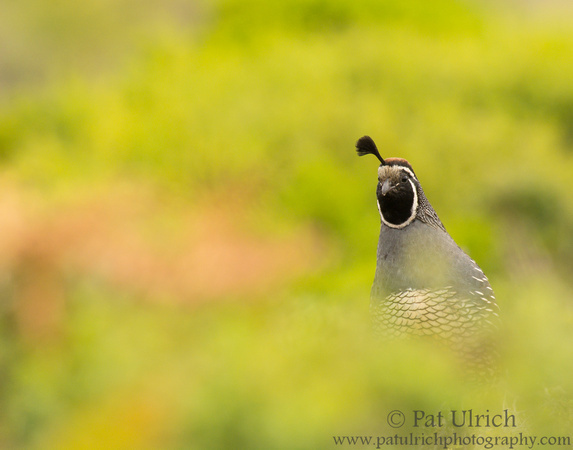 Browse more of my photographs of California quail. Submitted to Wild Bird Wednesday -- follow the link for this week's posts! 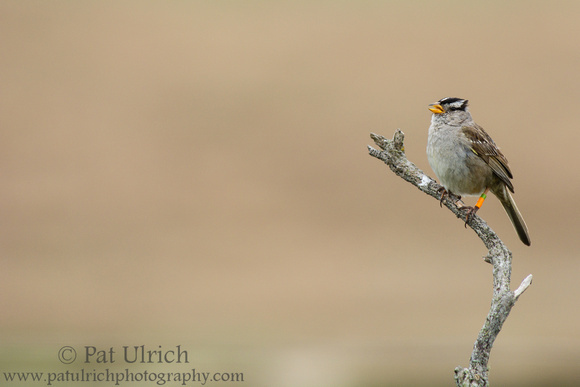 A white-crowned sparrow sings along the Abbott's Lagoon Trail in Point Reyes National Seashore. While looking for songbirds to photograph on my recent trip to Point Reyes National Seashore, my primary objective was to capture them perched in front of wildflowers. Of course, it wasn't always possible to get a bright, colorful backdrop in each frame. I was drawn into this scene by the old, weathered branch of coyote brush that this white-crowned sparrow was perched on. Even better, a distant hillside provided a clean background of neutral colors for the shot as it started to sing. This otherwise drab bird provided its own splash of color though, flashing its green and orange leg bands. Browse more of my photos of song birds. A mule deer hiding in the wildflowers along the trail to Kehoe Beach in Point Reyes National Seashore. The trail to Kehoe Beach in Point Reyes National Seashore is one of my favorite places to photograph wildlife set against a backdrop of wildflowers. The hillside along the trail seems to explode in a wall of color, and the flowers conveniently grow all the way to eye level. In the past, I've photographed some song birds like this white-crowned sparrow set against the colorful backdrop, and I walked this trail a number of times on my recent trip looking for similar opportunities. As I was scanning for birds perched on the blooms, it was a delightful surprise to see these big ears and eyes staring back at me from behind the flowers. 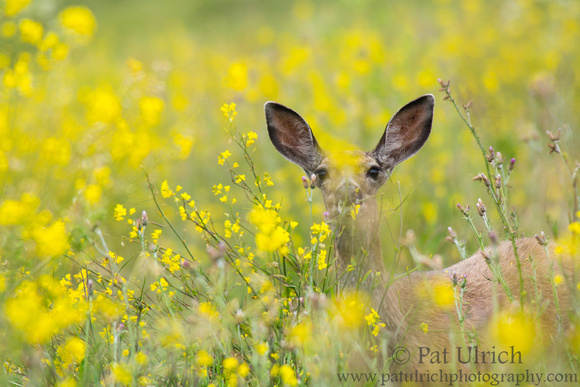 There was a slight breeze on this morning, so in many of my frames this lovely doe was distractingly obscured by the yellow blooms, but in this one, the flower stopped in the middle and gave a clean connection with her eyes. View more photos from the trail to Kehoe Beach in Point Reyes National Seashore. 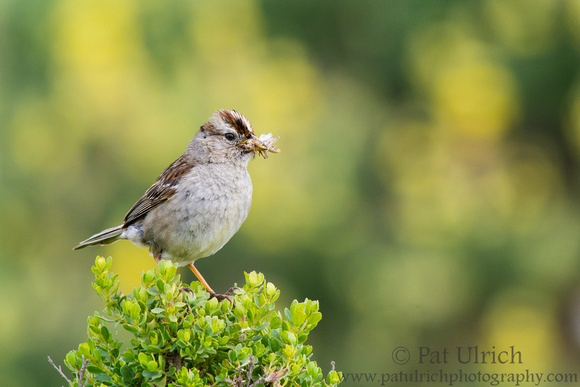 A white-crowned sparrow brings a beak full of bugs back to its young in Point Reyes National Seashore. During my recent trip to Point Reyes National Seashore, I dedicated a fair amount of time to photographing song birds among the early summer wildflowers. The first stretch of the Tomales Point Trail was absolutely covered in colorful wild radish and the trail to Kehoe Beach was also lined with dense wildflowers. These shots were taken on the trail to Abbott's Lagoon, which doesn't have as high of a density of wildflowers, but the yellow bush lupine was in full bloom (and provides the splash of yellow in the background here). 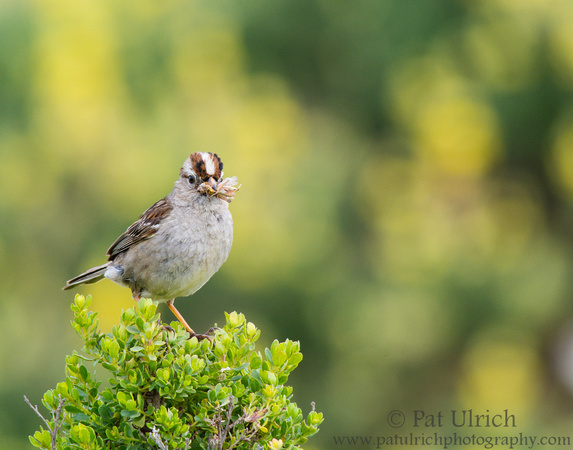 A white-crowned sparrow looks around before returning to feed its young. While I didn't see any nests, there were definite signs of young birds around with the parents bringing back beaks full of bugs. In the high-res version of these photos, you can clearly see that this sparrow returned with at least two grass hoppers crammed into its tiny beak. While on a much different scale, this behavior reminded me of seeing photographs of puffins returning to the cliffs with a mouthful of fish (definitely something on my lifetime photographic wishlist!). View more photos of songbirds perched on wildflowers in my Song Birds Gallery. 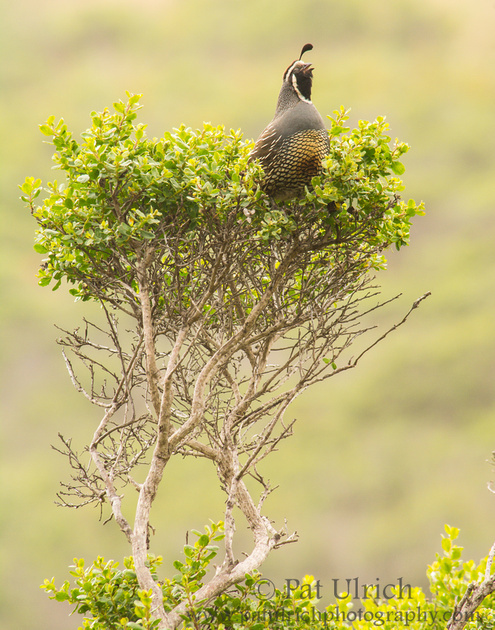 A California quail casts a curious glance at the photographer in Point Reyes National Seashore. 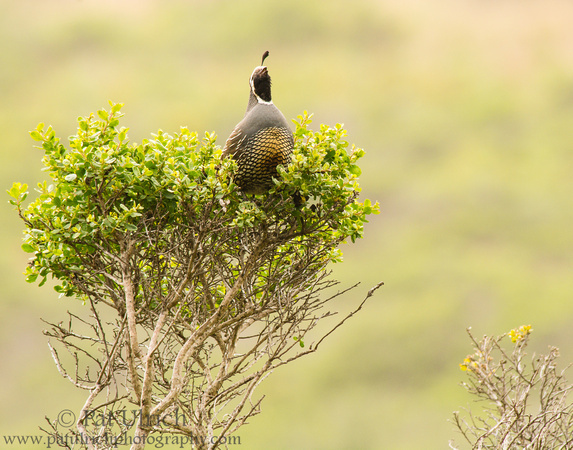 If you couldn't already guess from the banner on my blog, California quail are one of my favorite subjects to photograph, and Point Reyes National Seashore is a great place to get them in front of your lens. I photographed a bunch of quail on my recent trip there, and this was one of my favorite shots. Quail seem to have such personality, and the way that they turn their head in a curious glance cracks me up. For these shots, I was parked in the Abbott's Lagoon parking lot watching a few quail bouncing around the tops of coyote brush a bit further away, then out of the corner of my eye, I saw this guy pop up between the bushes to get a look at me. After slowing turning my lens toward it, it was exciting to see that it positioned itself behind another bush in a perfect way to provide a smooth out of focus foreground and background. An alternative view of the same quail after it moved higher on the coyote brush. As he made his way to the top of the bush, the delightful bokeh effect started to disappear, but he posed there for a while providing some clean portrait opportunities too. 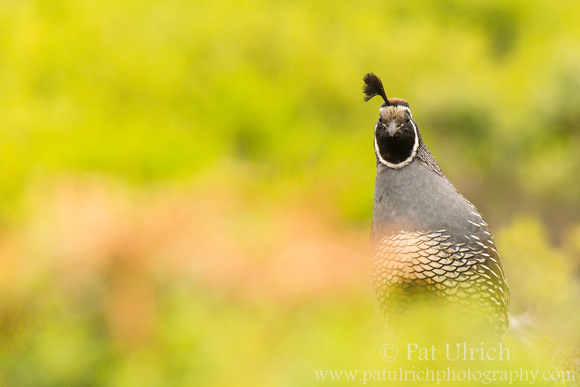 View more of my photographs of California quail. An overcast sunset casts a pastel glow over the landscape at North Beach in Point Reyes National Seashore. In June, I had the opportunity to take a trip to relax and focus on photography for a few days. It had been almost two years since I was last in California, so I decided to spend those 5 days photographing and hiking around my favorite park, Point Reyes National Seashore. While early June isn't necessarily what I would consider prime time for photography in Point Reyes, I had an exceptional trip and came back with a number of photographs that I’m rather excited about. The wildflowers were really putting on a show (especially the wild radish and yellow bush lupine), the tule elk were looking handsome in their summer velvet, quail were running around all over the place, and I even had a nice encounter with a bobcat. It was a truly refreshing experience to be back in a place that I love so dearly and to have the chance to focus so much contiguous time on experiencing the park through photography. Each morning I rolled out of bed with the first light under the fog and spent as long as possible photographing wildlife under the overcast skies. Then as the harsh light of the midday sun finally broke through, I'd pack away my camera and head out for a long hike. I hit up a number of trails that I had never hiked on during my five years of frequenting the park while I was in California, so it was great to experience new aspects of an old friend. Then as the sun started dropping, or the fog started rolling back in, I'd start searching for wildlife again. I came back with a ton of pictures which are partially sorted and processed so far. You can drop by my Point Reyes National Seashore Special Collections to see my new work as I upload it, and I'm hoping to post new images here on the blog with a regular rhythm over the coming weeks.